Spring has finally arrived on the South Shore of Massachusetts and Coastal Printmakers are celebrating with a new exhibit entitled Footprints in the Garden on view thru May 28, 2014 at the James Library and Art Center at 24 West Street Norwell, MA. All unique and original prints have a 12″ x 12″ image area (foot prints-get it?) and were created specifically for this themed show that is inspired by nature. 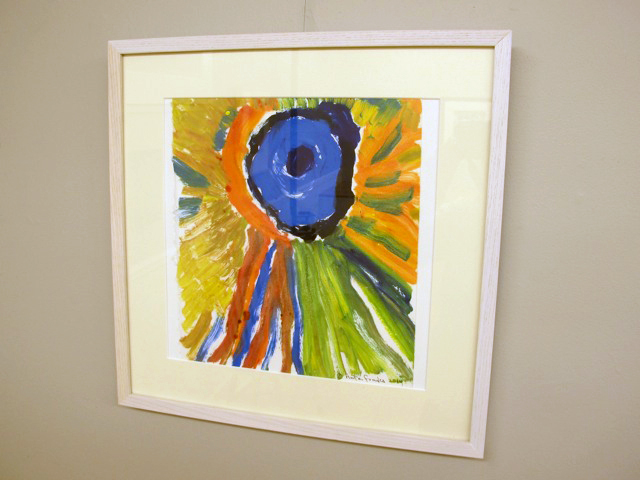 Each piece in the exhibit depicts the character and creativity of the artist such as the above monotype by Anita Franks who is inspired by artists such as Authur Dove and Wassily Kandinsky. Although this piece is abstract it suggests nature from the smallest life force of a single cell to the vibrancy and power of the sun. 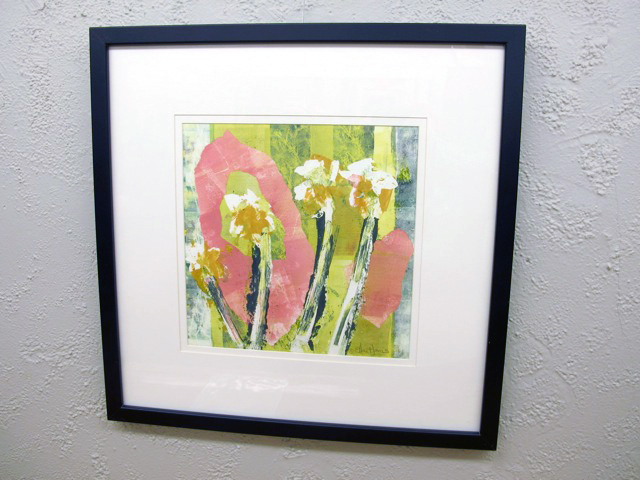 Monotype entitled ‘Water Garden’ by Esther Maschio. Esther Maschio is the printmaker who is the driving force behind Coastal Printmakers. She has taught printmaking at the South Shore Art Center in Cohasset, MA for 20+ years and continues to inspire and encourage artists of all skill levels. Her studio classes are consistently popular with many of her students attending year after year. 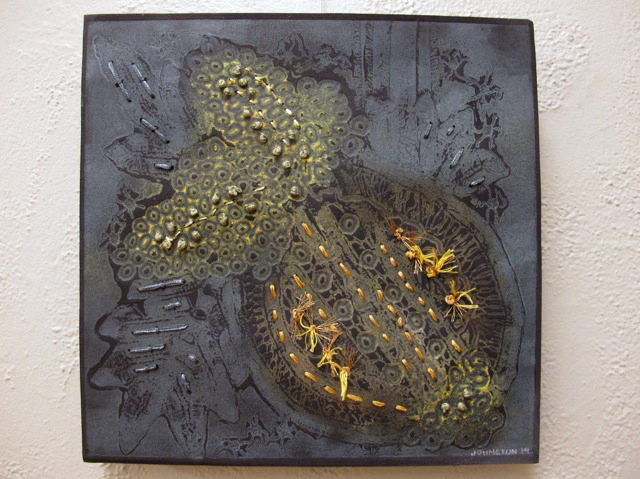 Collagraph with embroidery by Jane Johnston. 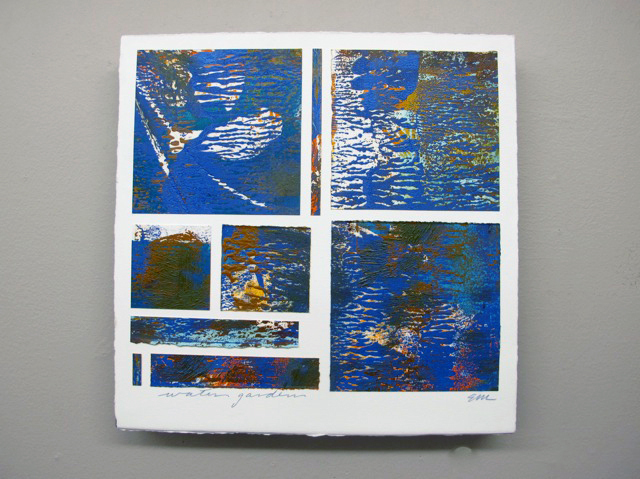 Jane Johnston is a collagraph expert. She uses a variety of materials to construct her prints that range from fabrics to fragments of drywall tape to just about anything she can get her hands on. Her pieces are thoughtfully constructed and are a balance of mechanical genius and organic madness. The Footprints in the Garden exhibit will continue thru May 28th and will be part of the Books in Bloom fundraiser that takes place this Friday, May 9th, at the James Library and Art Center. Three floors of spectacular floral displays interpreting books, light fare, cash bar, light music and more. Looking for a fun Mother’s Day outing this weekend? Bring Mom to the Books in Bloom Open House this Saturday, May 10th, from 10 -1 p.m. Stop by and enjoy three floors of 25 spectacular floral displays depicting books. Details at www.jameslibrary.org. Free. Thanks for including my piece in this post! I thought the show looked pretty darn good. Hey folks- go see it! You are currently reading Footprints in the Garden at donna ingemanson studio.